Allah says: “Fighting is enjoined on you, and it is an object of dislike to you; and it may be that you dislike a thing while it is good for you, and it may be that you love a thing while it is evil for you, and Allah knows, while you do not know.” (02: 216). 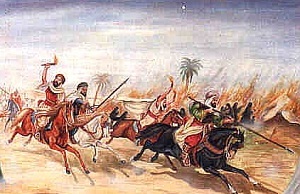 Fighting was not incumbent or allowed for Muslim in the beginning of the Call to Islam in Mecca, so the Prophet (p.)’s recommendations to the believers who were persecuted and tortured were patience, immigration, endurance and sacrifice… He even allowed them to say what they were asked to say, even if they were expressions of disbelief, under torture and coercion, as in the case of Ammar Bin Yasser about whom the following Ayah was revealed: “He who disbelieves in Allah after his having believed, not he who is compelled while his heart is at rest on account of faith, but he who opens (his) breast to disbelief-- on these is the wrath of Allah, and they shall have a grievous chastisement,” (16: 106), having said words of disbelief while being under intense pressure and torture. First: Perhaps this was associated with the first phase from which Allah wanted His religion to set out in people’s lives. It might have been necessary for the very first believers to live the inner and outer sufferings caused by the psychological and daily life pressures imposed by the disbelievers. As such, this would create an atmosphere of wonder, interest and sympathy by the other people through the diverse influential factors that govern the peacefulness of the Call. Second: Engaging in a violent struggle with Quraish tribe might have been impractical according to the calculations made in view of the balance of powers, considering that the Call emanated from the central area dominated by Quraish, which renders engaging with this tribe in a clash from an upper hand position something rather difficult if not impossible. Third: The Call was in need of calm ambiences to let its words be heard and not to get lost amid all the sounds of fighting and arms. In this way, the calm words would leave a positive impact on people’s souls, even if through the negative stands from it. Any kind of call needs a peaceful and serene phase that enables it to reach people’s minds and ears, away from any other pressuring factors. The greatness of the Islamic Call lies in that it came to address the minds, and consequently impose its convictions using proofs and arguments, as well as dialogue, instead of force and pressure. This drives the Call to work on preparing the practical means that guarantee all that. Perhaps this is the point that necessitated this peaceful and enduring method and the option of immigrating to be prevalent in Mecca, considering it the best place in which the Call can reach every heart and every ear, for it is the cultural and religious capital of the Arab peninsula, which renders it the center of gathering in the cultural and religious seasons, such as the season of Ukaz and Hajj (pilgrimage), or the commercial seasons slightly after the winter and summer trade journeys. This compelled the Call to remain present in Mecca for the longest possible time, so as to benefit from that in the course of achieving the big goal, considering that it would be able to reach some Arab circles it could not have reached had it not been for that. Fourth: Perhaps, the Prophet (p.) aimed, from preventing the believers in Mecca to engage in an armed clash with Quraish, at giving those who embrace Islam - who are mostly weak - the opportunity of gaining power in a gradual manner away from any difficult duties that might exert pressures on their wills and abilities. In this way, they would not feel burdened, from the beginning, with the task of fighting; thus, they would be able to dig deeper and reach higher levels of faith and to take the gradual steps of progress at the level of the doctrine and work in a realistic manner that enables them to expand and move in an ambience of calm thought and realistic smooth steps. In this way, Islam managed to fortify its bases by creating an entire generation of callers who experienced the cruelest and severest sufferings. They set out with Prophet Muhammad (p.) to Al-Madina to plant the seeds of the new Islamic community, and so the new phase of Islam started in an ever forward-going process by building an internal strength capable of facing a challenge with a similar challenge and going over the obstacles placed in its way to prevent it from moving forward. As such, fighting became the ordained duty of that phase. This Call was faced by many psychological barriers, as some Muslims were accustomed to and felt at ease with - or so the Ayah suggests -the peaceful call that receives hits and does not hit back. [They believed that] the pressures they were enduring through persecution would not subject them to the big danger that fighting will normally subject them to; rather, all they were facing were difficult and pressuring psychological distresses they were used to bear with full patience and faith, whilst preserving the line of peacefulness and safety in life. It seems that they might have expressed a very strong feeling of dislike to this difficult duty, or objected on it or tried to get rid of it, as suggested by this expression “and it is an object of dislike to you”, for it meant marching towards death willingly, and it meant going on with it as long as the challenges of disbelief and atheism persisted. Islam adopted the method of driving the Muslims to embark on practical practice through intellectual conviction and spiritual response, not to mention the total compliance at the level of the faith imposed by the Islamic doctrine that is based on total submission to Allah. Thus, this Ayah came to say that one might love what is of no great interest to him or hate what is of no harm to him, which suggests that the impulsive psychological states cannot be a means for determining the negative or positive decisions in life. The reason is that impulsivity emanates from the surface and not the core, since it represents a reaction to a sudden shock, a swift whim or naïve emotions. Therefore, one should study the issues and stands thoroughly and infiltrate into their reality to find out the nature of the realistic advantages and disadvantages they contain, and consequently reach the conclusive result that prevents him from succumbing to his swift impulsive reactions. Man might discover that by studying the history of his personal life, and specifically the incidents of impulsive reactions he had undergone and by reflecting on their negative results. Hating something does not necessarily signify that it is wrong, and loving something does not necessarily signify that it is right. It is something one discovers through his personal experience, so if he follows the line of faith, he will discover, from the window that overlooks the ultimate truth of faith, that Allah knows the truth behind all things and He knows what is beneficial and what is harmful to man, as much as He knows how to legislate what conforms to his wellbeing on the basis of wisdom and mercy. On the other hand, man only knows the tiniest bits of everything; that is why we notice that he rebels, expresses doubts and reacts impulsively. As such, the Quran touched upon the situation from an intellectual aspect that is based on experience and from a faith-related aspect based on the doctrine. The method the Quran adopts in finding solutions for man’s inner problems is represented by leading him to conviction through reality and faith. Moreover, this Ayah reveals that there is an implicit question lying therein after legislating fighting or a question posed in a flexible and suggestive manner, so the Ayah came to answer all these questions. First: Those who work for the sake and cause of Allah ought to inspire this Ayah in other aspects of legislation or work for the sake of Allah, which might lead some to protest and others to object, or it might lead them to rebellion or indiscipline. They should inspire that the faith-centered upbringing should be based on the feeling of the necessity to act in accordance with the reality of experience and the movement of the doctrine. In this way, the Islamic character would be consolidated in its strong and aware positions so that it would not even blink before any impulsive reactions, it would not fall prey to swift urgent reactions and it would not undertake a path whose ends and dimensions are unclear. Rather, it would consider anything with full contemplation and meditation, without any difference between the challenging situations and the relaxing ones, so as to study everything objectively and without bias. In this way, the enemies will not be able to force it into a battle of no known course, bases and timelines, and the friends will not be able to lead it to a path it does not know how to handle in terms of its slow and fast steps; rather, it would stand in-between and make its own choice of the line it finds suitable on the basis of an aware objective study founded on knowledge and faith. Second: Islam takes the reality into consideration in its legislations, for it admits the difficult reality and the bitter experience, but at the same time, it reveals to man the deepest secrets, the big gains and the happy endings behind any issue that is the subject of legislation. In this way, it fulfills man’s physical or moral desires that surpass, by opening up on it, all the difficulties and bitterness, so he would welcome it instead of getting complicated from it. Third: The calculations of good and evil man does should come from the deep and wide view of what Allah has, either by what the mind grasps by contemplation or by what is revealed to him so that man’s considerations would be based on those of Allah and not those of worldly matters. Fourth: Being reassured to the wisdom of the Divine legislation through the faith-based truth which says that Allah is the One Who knows the secrets, hidden aspects and ends of all things. Therefore, one should be confident that any legislation entails all the good for man, away from the personal emotions and reactions it brings up in the soul, whether positively or negatively. Therefore, he should not reject a certain religious ruling just because it does not go with his desires, for desires have nothing to do with the advantages and disadvantages; rather, they are related to the superficial aspect of man’s life.